As some of you know, I’m a regular contributor from Europe to Gadling.com, AOL’s literary travel site. 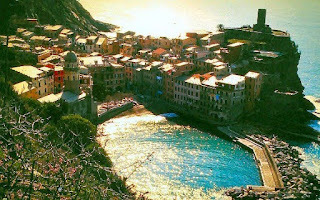 My latest posting comes from the Cinque Terre, which I explore from above, away from the crowds. Here’s a teaser, with a link to the article on Gadling.com. Please share! A seagull and hawk dueled in the clear, blue sky directly in front of our noses. Waves crashed but we could not hear them, because they were far too far below. Was this the land of dreamy dreams? No. Try the Cinque Terre. The grapegrowers and woodsmen of the old, impoverished Cinque Terre used to be the exclusive owners of the view from on high, from what’s now known as ridge trail #1. That view features not only seagulls and hawks but also stunted pine trees, scalloped scrabble cliffs, and tiered terraces planted with low grapevines and gnarled olive trees. All seem to be tumbling into the Mediterranean….